If you’re reading this after your hundredth failed attempt to survive that ridiculous final level of Super Mario Odyssey, then a group of Canadian researchers have some great news for you. 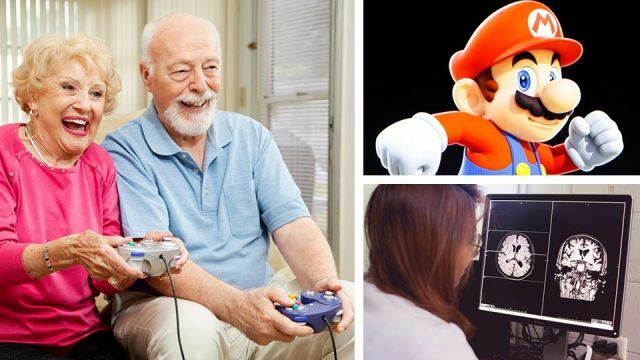 Turns out, your video game addiction might actually be good for your brain — at least in terms of warding off Alzheimer’s Disease later in life. The surprising findings were the result of a recent study into possible methods for keeping the elderly brain in good shape. The researchers from the University of Montreal started by dividing volunteers aged 55 to 75 into three groups. One group was given the enviable task of playing video games for at least half an hour a day, five or more days a week for a total of six months. They were, however, given just two games to choose from: the popular Super Mario Galaxy and its classic great grandpa, Super Mario 64. While this group whittled away the days stomping mushrooms and battling Bowser, a second group of volunteers took up piano classes instead. A third group acted as a control. The results were promising — at least for the senior citizens-turned-gaming fanatics. “After training, a within-subject increase in gray matter within the hippocampus was significant only in the training group, replicating results observed in younger adults,” researchers concluded. In other words, playing video games might be better for your hippocampus than learning the piano. This matters because the hippocampus plays a critical role in the memory process. Keeping this part of the brain healthy is one of the biggest challenges for anyone hoping to avoid Alzheimer’s. Along with benefiting the hippocampus, Super Mario was also found to bolster gray matter in another part of the brain involved in memory: the cerebellum. Among all this, researchers also noted the gamers improved their overall short-term memories. “Together, our current results provide support for the hypothesis that new cognitive activities can prevent the negative effect of age on hippocampal gray matter, and that casual video game training can directly increase gray matter in the hippocampus and improve memory abilities,” researchers concluded. Meanwhile, the control group “displayed significant gray matter loss” in both these areas of the brain. As for the piano players, they too experienced gray matter growth in the cerebellum, but not in the hippocampus. However, before you ditch your Kalkbrenner for Kondo, bear in mind the piano players did exhibit their own unique benefits. Specifically, their dorsolateral prefrontal cortexes fared much better than either the gamers or the control group. Before you start stocking up on Mountain Dew and get too cozy in your beanbag, you might want to note the researchers did concede their findings may not apply to all video games. “This is achieved through the building of relationships between landmarks in the virtual environment to create a cognitive map,” they continued. For example, gamers moving through the virtual world need to build “relationships between landmarks,” such as rivers, buildings and wherever that sneaky Boo could be hiding. On the other hand, it’s unclear whether other genres of video games — such as those with less of an emphasis on spatial learning — could be of any benefit to aging brains. Sorry Call of Duty. On a positive note though, the researchers suggested their findings could be used to develop the next best weapon in the fight against Alzheimer’s; a video game with a focus on spatial learning specifically tailored to older gamers. “The development of such a training tool could have a positive impact on healthy aging,” they said. Hey Buddy!, I found this information for you: "Don’t Want Alzheimer’s? Play Video Games, Says Study". Here is the website link: https://www.thealternativedaily.com/video-games-may-help-prevent-alzheimers-disease. Thank you.